which od of these fg will be better and faster for drag racing on asphalt? and also with better traction? the fg baja or fg sportline car? The meanest drag FG I've seen was a leopard, 2spd, TS engine, HPI Tarmac busters on the rear. I can say from what I have been told it stood un-defeated at the track. So for your question, Starting with a Baja would better than a sportline in my opinion. I own both and I'd have to say that the Baja is the way to go. We basically run onroad wheels on our bajas and they are quicker and more controlable out of the box than the sportline. My sportline has more top end, but it takes it longer to get there. 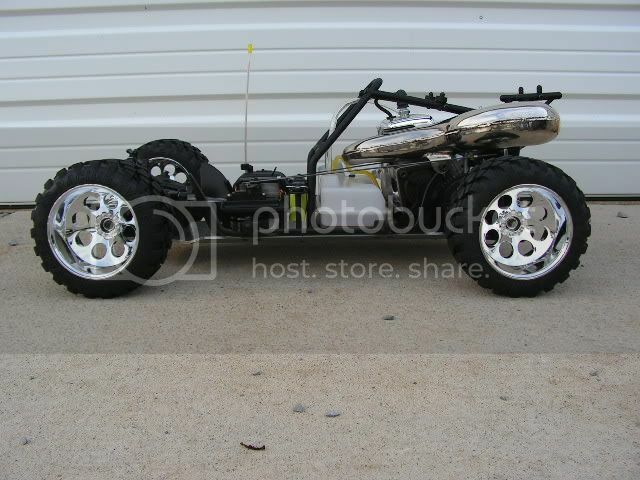 My Baja was clocked last nite at a notch over 70 and it gets there pretty quick but the sportline still has more top end. 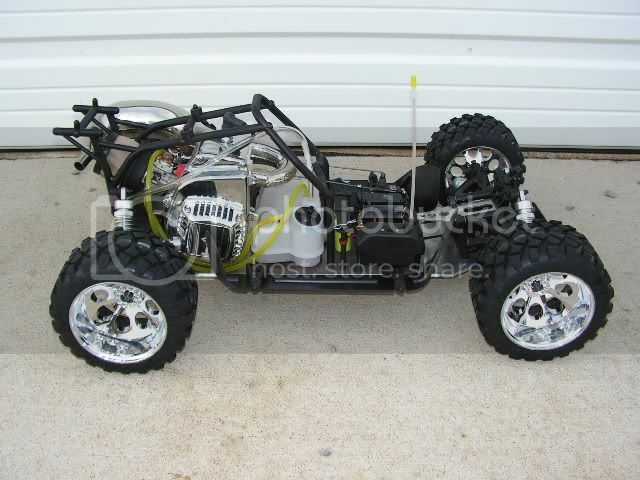 what about if you gear the sportsline to take off faster will it then beat your fg baja? or will the sportline just spin out on take off becasue of the lower gear? how much feet do you guys drag race on? 200 ft plus?? It's just as much about weight transfer as it is power. With a higher center of gravity and softer springs and shock oil, the baja will transfer much more weight upon acceleration and will beat the sportline off the line. If both cars are geared the same and have the same motor, the baja should win. also for dragging is it better to have the springs stiffer or looser? 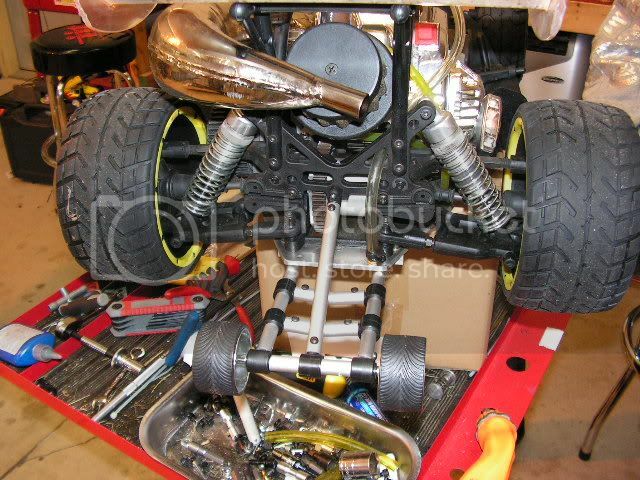 and also is it better to take off the spacer off the stadium truck or keep the spacer on for the springs in order to get a better traction when taking off ? GET BOTH!! SEROUSLY.. but as most only buy one at a time i would start out with the baja unless you plan on racing on a prepared track. the sportsline will have a hard time hooking up on a normal parking lot. even with the best tires and countless bench hours tuning your suspension, the sportsline will still be pretty slippery. and you will need a HUGE EMPTY parking lot to really enjoy it. 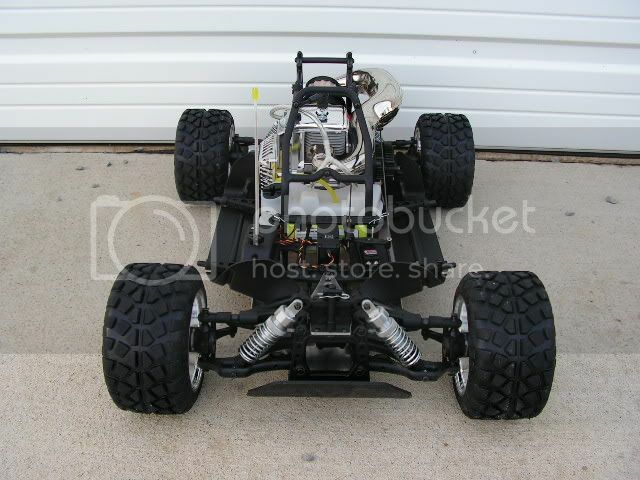 the baja is easly set up for the street and will hook up perfectly with little effort. I agree the smaller tires of the sportline are never going to get enough grip off the line. When we built the one pictures, we went with a low stance & left the rear a bit softer to allow as much weight transfer as possible to the rear. Depending on what kind of power you have, traction can still be a fairly big issue. This Leopard started like these pictures & even with compound on the track, would not hook up well off the line with the FG stadium tires. 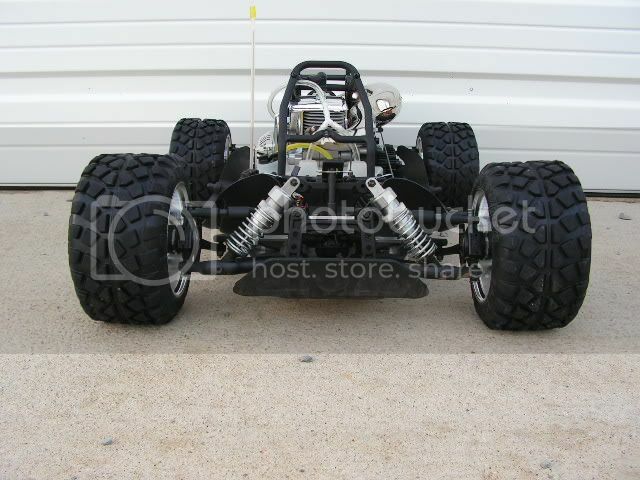 It had serious power in it though, thats how we ended up with HPI tires. Reasons are better traction & lighter wheel & tire combo. That is one sweet looking FG! For teh TS engine, what is in it? Is that a stroker and ported head kit? This is one of the first TS engines & is a stroker. We modified the 2 spd. hub to with stand the slam when it shifted. I never got to the track to see it run there. We were running test passes when we changed to the HPI tires one day. I watched it pull the front wheels when it shifted into 2nd & it had to be running over 35m.p.h. at the time. The owner at the time said it was clocked at over 76 m.p.h.. I never seen a radar run myself, but I have seen many that were in the 60 range, and this one was definitely quite a bit faster. Someone near the Chicago area owns this beast today. which tires are better for traction on street parking lots, the hpi tarmac or the fg slicks? do the tarmac grip good and a little dusty asphalt? Don't know of anything that is going to get traction on that kind of surface. I can testify to that cos mine was slamming into second and lifting the wheels 3-4' off the ground...I was running 48/16 set to shift at peak revs, I've backed it off a little now to soften it up, it's ok on dirt but hooks up instead of spins on asphalt. what do you mean by :4 plate diff ??? what does that do and is it good or something?? can any of the ddm pipes or jetpro pipes fit on the sportsline? and which ones?